You are twentysomething and in the prime of your life. You are current, capable, cosmopolitan, and completely confused! Thrust out of the comfortable existence of a college student and into the cold, hard reality of life in the "real world", you face a whole new array of responsibilities. You have to find a job, possibly relocate to a new city, find a place to live, figure out how to pay the bills with the entry-level salary you land, make new friends, and find a church (just to name a few)! The good news is that you're not alone. Margaret Feinberg - twentysomething herself - wants you to know that there are tens of thousands of others facing these same challenges. "Our twenties really can be some of the best years of our lives, no matter what our landlords, bosses, parents, or anyone else says," encourages Feinberg. Offering Scriptural insights, encouragement, humour, and practical wisdom, TWENTYSOMETHING confronts this "crisis" and shows you how to survive without losing your patience or your passion for life. 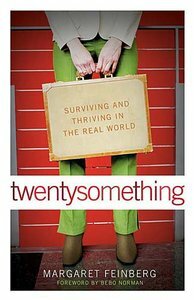 TWENTYSOMETHING will inspire you to hold onto your dreams and to embark fearlessly on the journey God has for you. - Publisher Thrust out of the comfortable existence of a college student and into the cold, hard reality of life in the "real world," young adults face a whole new array of responsibilities. Feinberg--twentysomething herself--offers Scriptural insights, encouragement, humor, and practical wisdom to help readers survive. Thrust out of the comfortable existence of a college student and into the cold, hard reality of life in the "real world," young adults face a whole new array of responsibilities. Feinberg--twentysomething herself--offers Scriptural insights, encouragement, humor, and practical wisdom to help readers survive.